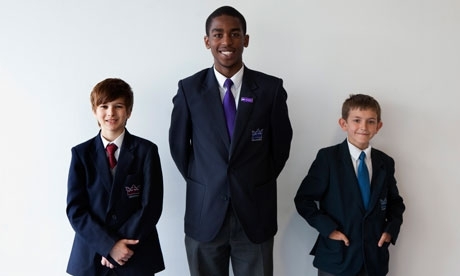 A secondary school has divided its students by ability, complete with different uniforms. Innovative way to lure the middle classes, or worrying segregation? Students with purple ties are gifted and talented. All the children at Crown Woods college in Greenwich, south London, know that. They are taught in separate colour-coordinated buildings, play in fenced-off areas and eat lunch at separate times. At 11 years old, all pupils at the college are streamed according to ability in what the headteacher argues is the only way to survive in the brave new world of market-driven education. Crown Woods re-opened in May this year after a £50m rebuild under the Building Schools for the Future programme. Based on a small-schools model in the US, the pupils are ranked as they leave primary school and put into one of three “mini-schools” on site. The gifted and talented go to Delamere. They have purple badges on their smart blazers. The rest go to Ashwood, which wears blue, or Sherwood, which wears red. These two schools are more mixed ability, but they are still streamed into three tiers. Each school has 450 students and functions independently. There are no shared subject departments. The light, bright white corridors in the nine new buildings make the site feel more like an art gallery than a state comprehensive. The state-of-the-art competitive gym with capacity for 450 people feels like a professional facility. There is a sensory garden and design centre named after William Morris. The use of prefects, the school’s stately crown logo and the formal use of the tie in the uniform add to the traditional posh-school image, but this school’s facilities are available to all students, and it offers vocational subjects.